This is plate 9 from William Hodges' book 'Select Views in India'. 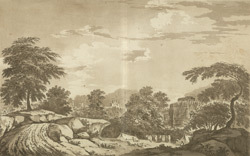 The British attacked the fort at Latifpur in 1781, at the time of Hodges' visit. Before the attack, the fort was occupied by Raja Chait Singh, who had staged a rebellion. Although the British successfully took control of the fort, Cahit Singh escaped and retreated to Bijaigarh, and then to Gwalior. The stronghold of Bijaigarh was subject to a prolonged seige under the command of until Major Popham. Hodges was at that point sent by Hastings to make drawings of all the forts.